-We have 3 small churches in the drought affected areas of the Highlands in Simbu province: Gumine (around 30 members), Kalvery (about 10 members) and Mogiagi (about 5 members). Access to Gumine is by plane and road. To reach Kalvery and Mogiagi, which is more remote it is a further 8 to 10 hours by foot (no road access). -Over $12,000 was raised by the SPA Churches across Australia. 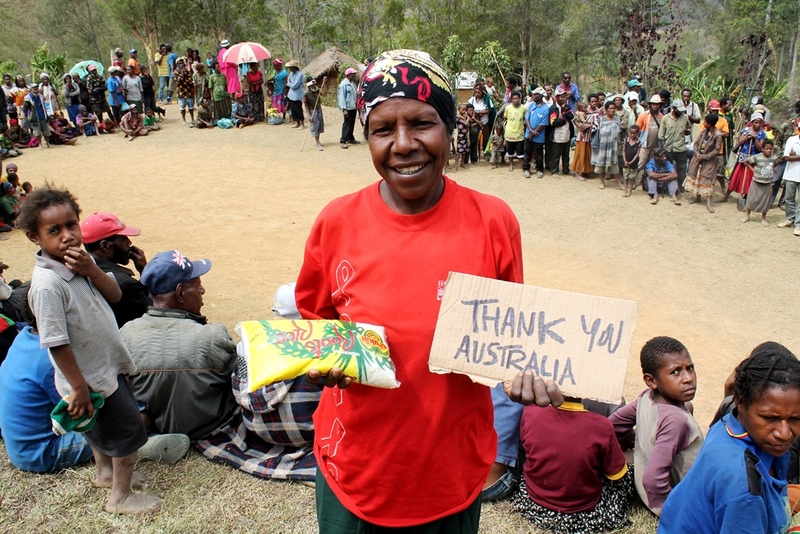 -A drought Committee was formed in PNG to ensure the food aid was delivered efficiently. This was a mix of staff from the Port Moresby Church of Christ (in the Capital) and HOPE worldwide PNG. They met in early Sept to plan the food aid distribution. -September 1st- the first lot of food made it's way up to Gumine with Jon Jon (leader of the Gumine Church of Christ). What helped to move things quickly was that the Brisbane COC gave some of their donation as cash on Sunday directly to Felix ($1000). Felix was on his way back from Brisbane to PNG from a singles conference and so was able to deliver this to Jon Jon on Monday. Jon Jon was immediately able to purchase a first lot of food for the Highlands and distribute this and didn’t have to wait for the wire transfers to clear (1-2 days). -The churches in Gumine, Kalvary and Mogiagi were really grateful. One of the brothers (Mattheous) shared how moved everyone was: "it took us just one phone call asking for help and this is how quickly and generously our brothers and sisters in Australia responded- Thank you so much!" -September 10th a group of 5 disciples from Port Moresby: Joan, Francis, Felix, Mary and Francil went up to Gumine with food (bags of rice) purchased in Kundiawa (the nearest main town to Gumine). -The team met with provincial coordinators of the drought relief and also had armed escorts to avoid food being stolen on route. 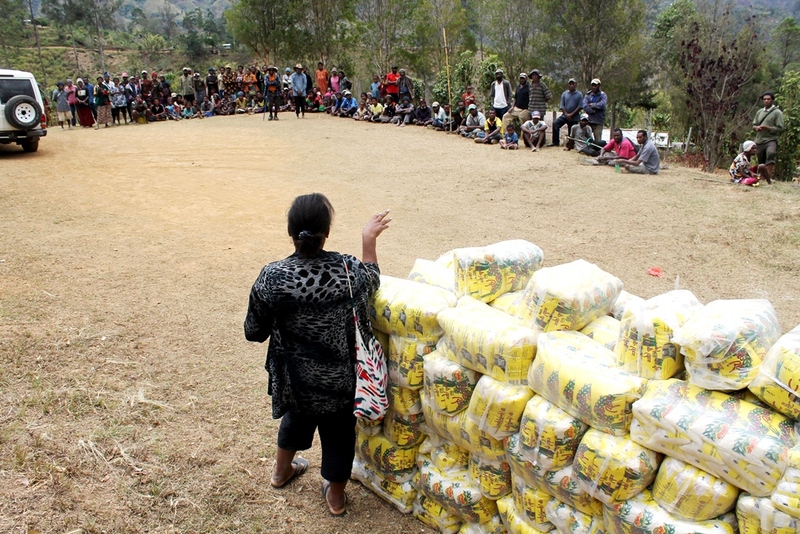 Food aid was delivered to three areas: Gumine, Kalvary and Mogiagi. -Rice bags were distributed to the wider communities in Gumine, Kalvery and Mogiagi so that over 2,500 benefitted. There was a lot of joy from the community and many turned up for Sunday Service to thank God! -Prayers for rain have worked- it started raining at around the time of the first food delivery- the first rain in 6 months! -It will still take time for crops to start growing (3-4 months) so more rain is needed- keep praying!! -The food aid is temporary and more may be needed in the coming months. The government relief is very slow due to poor infrastructure and lack of funds. Today a small group of volunteers visited the 6 Mile School which is lead by John-Fosse, Angela & Dorcas. The school is a vital project providing education to children in the surrounding settlement. In the coming weeks we will begin a sponsorship program to boost donations for the school. HOPE Volunteer Corps makes the Newspaper! Update from HOPE Volunteer Corps PNG! After a long day of travel on 1 July all 22 pieces of luggage and 15 volunteers were welcomed warmly in PNG by disciples from the Port Moresby Church of Christ. Our first day of work began with a morning devotional with the HOPE staff and volunteers at the Lawes Road Clinic. We then divided up into two groups for a day of work. One group stayed at the Lawes road clinic and did staff training while the other group went to the 9 Mile Clinic to do some cleaning and painting. Anna and I started off our internship on Friday the 14th of June. 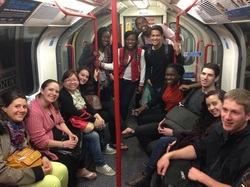 The internship began with fellowship, icebreaker activities, a lesson at the Hinkle's and a tour around London to see the campuses that we would be on. The lesson focused on our theme of the internship to be be a light of the world and how we shine in a place where darkness is so evident. The energy on the first day was incredible, with everyone zealous and ready to work hard for the campus ministry here in London. The second day we went back to the Hinkle's to meet some of the staff in the church and more fellowship to build closer relationships with our fellow interns, we then had a tour of the British Museum to look at Biblical artifacts within the museum whilst referencing them back to the Bible. One particular artifact stood out to me was a cup belonging to Artaxerxes who was the king of Persia, which historians think that it was plausible Nehemiah used that particular cup, I found it amazing that something like a cup could bring the Bible even more to life. The third day we had church and God blessed us with two visitors from simply being lights to the people we were interacting with during our tours around London. It has been incredible to see what God has been doing since we have been here already and we cannot wait to see what God will be doing over the next month as we fight the good fight for the people of London. Please keep us in your prayers and to God be the glory. Welcome to God's family Santhi! Santhi Yazala, who is from Hyderabad India, worked for HOPE worldwide in Afghanistan for 4 years with her husband. She has a big heart for the poor and needy. More importantly, on visiting Australia, she really wanted to seek God and His will for her life. God opened her heart to the truth in the scriptures and Santhi, with great joy, was baptised on Sunday 28th April. "Do you believe Jesus died, was buried, and raised again on the third day?" "Yes", "What is your good confession?" "Jesus is Lord!" Then Sam, Jared and Aaron pushed my whole body into the water so I could be reborn, thank you! It was a very special feeling when I was pushed into water. The world suddenly became quiet and I could hear my heart beating. My mind was clear as I realised everything that was happening. After that, everyone sang a song to me, I received about 5 bath towels, and lots of hugs. It made me feel that I am a part of the church and have now entered the kingdom of God. There was an urgency to get into the water on Sunday afternoon as Mike Vassallo asked Rachel Santosh for her confession of faith and the lordship of Jesus and then immersed her into Port Phillip Bay. The teen ministry was beside her and beside itself with joy - and not only the teen ministry - we are all totally ecstatic fot you Rachel! Ian Paton Servant of Christ! About twelve months ago Kelly Wells thought she recognised a spiritual interest and a humility to God in one of the Senior Managers at ANZ. She has been praying for Ian since then as have several of us. God was working and through the turmoil that has recently overwhelmed his life Ian has seen Jesus clearly and his need for forgiveness. Ian was baptized into Christ last Sunday February 17, 2013. Welcome Brother! Michelle has been a friend of Irene Yoong's for years - ever since they were work mates. When Michelle and her family moved to Melbourne from NZ Irene was quick to get Han, Michelle, daughter Pearline and son Sean, the whole family, introduced to the Church. 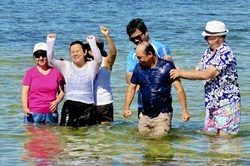 They were welcomed into the Camberwell ministry, they were eager to study God's word and soon, on February 9, Han and Michelle were baptized into Jesus. Praise God!